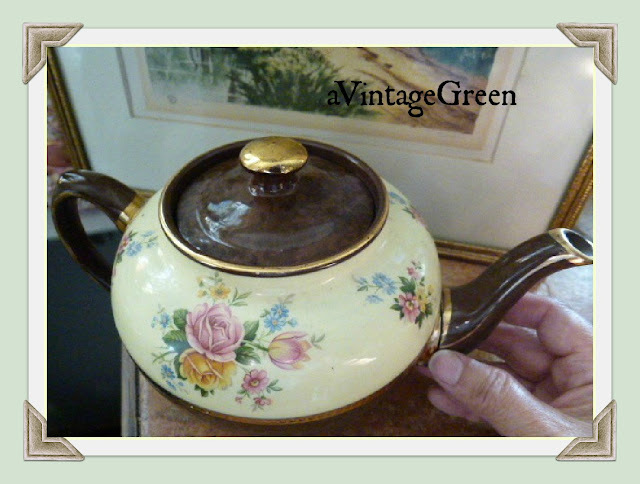 Such a handsome Sadler teapot, vintage, great character. 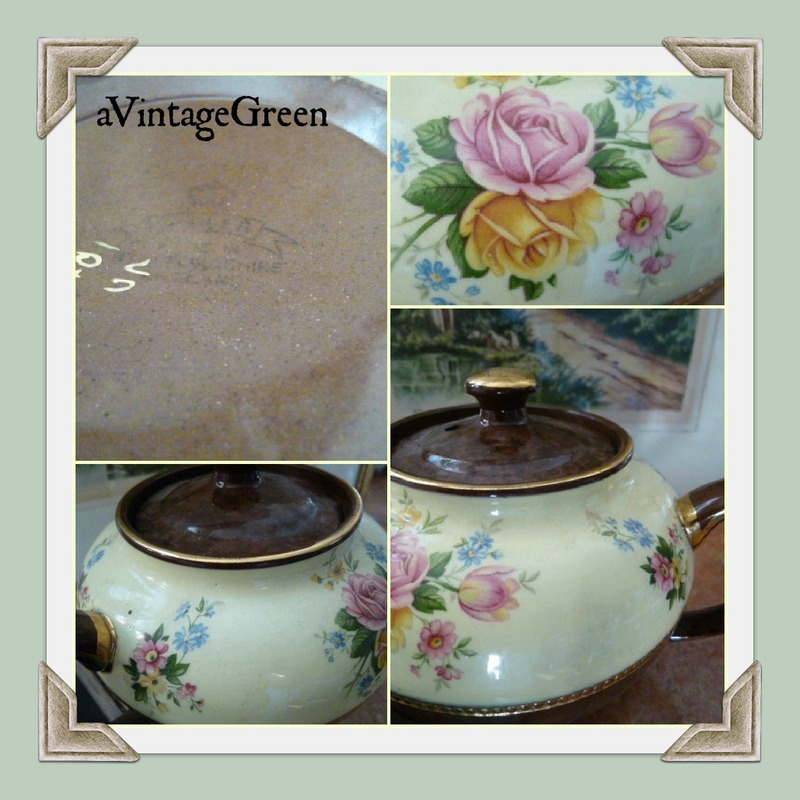 Brown Betty with gold accents, roses and pastel flowers. Just the style I love to find while out thrifting. Setting it into the backseat - the spout fell off. It had been glued on and I hadn't noticed. Usually I check the spout, rim and base for chips. Never thought to check the spout join. 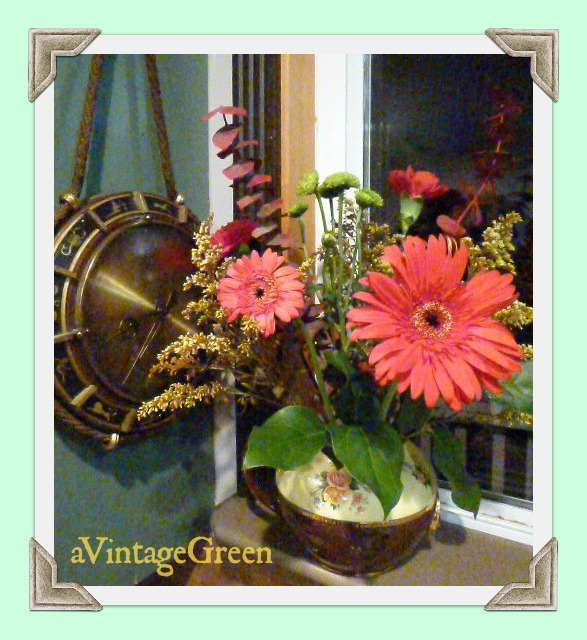 into a vignette with the old chiming clock. I may reattach the spout another day. Beautiful before...and gorgeous after!! I love your creativity!! I found a lidless, gorgeous teapot for a quarter not long ago...had visions of various uses but it has been used for a creamer ever since I bought it. Such a perfect size & so darned pretty that I enjoy using it! 😊 Love those bargains, don't we?! What great treasures! Thanx for sharing them at THT! Great floral arrangement! You can see you really have a talent for design. Lovely repurpose for the teapot. I am glad you decided to love it warts and all! What do they say if you end up with lemons make lemoade yours turn out great. The flowers looked great in the teapot. Too bad about the spout, but I love how you still found a purpose - it's a great teapot! Great repurpose..lovely! I love Gerbers. Repurposing at its finest! I'm really liking it as a vase now. Great idea. What a lovely teapot! 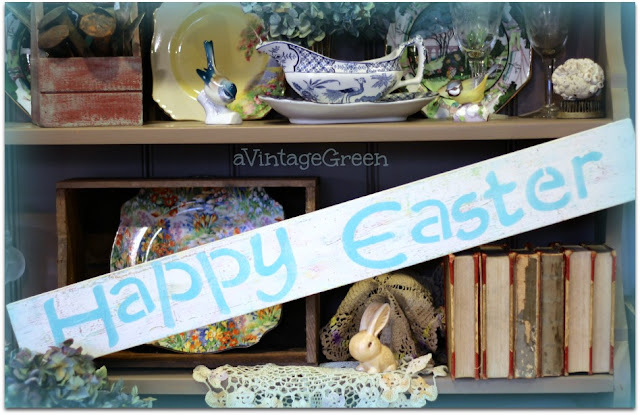 And a great repurpose :) Have a wonderful day! 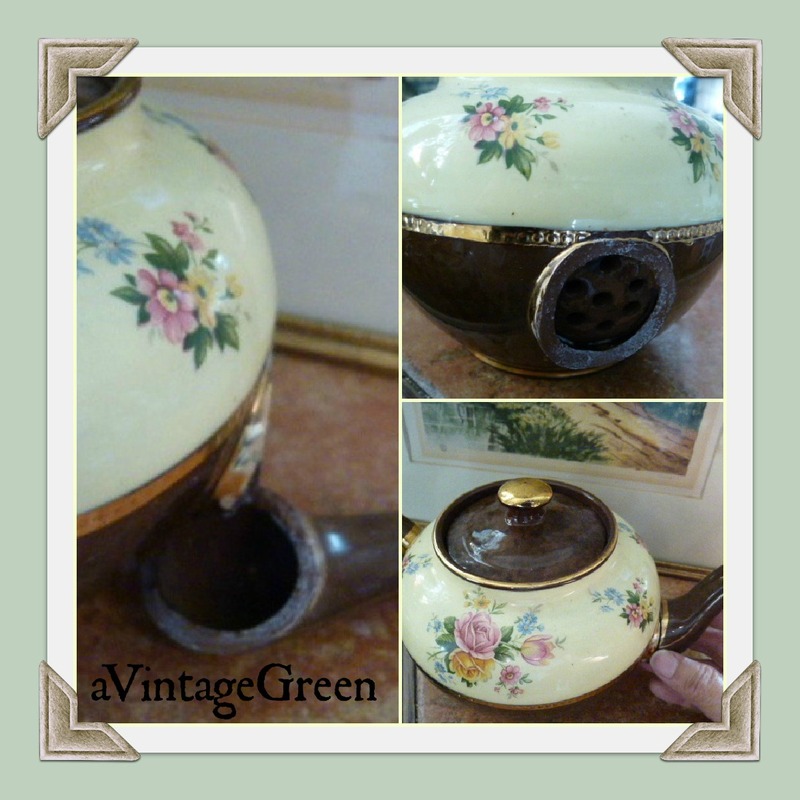 Great re-purposing of this beautiful teapot into a vase! I'm sure it's quite happy at having a second chance at "life". I love the teapot and would have picked it up as well. 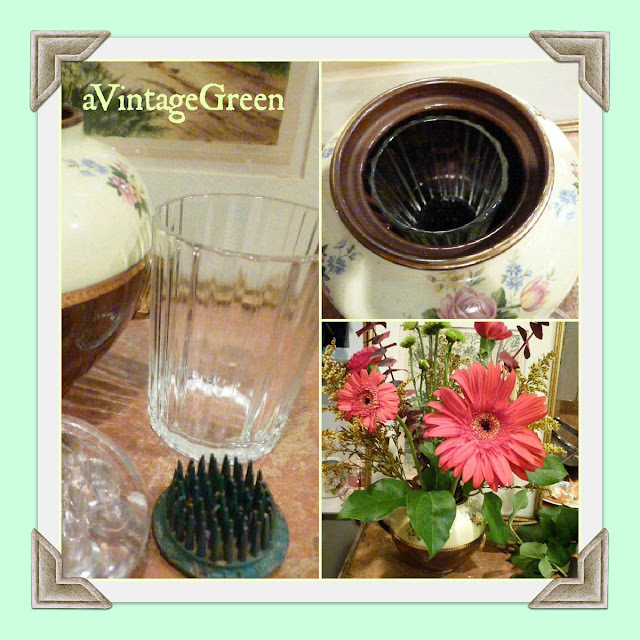 So glad you are so talented and could repurpose a lovely item! What a wonderful vase and arrangement! Happy VTT! That's a great idea! This way you can still enjoy that lovely teapot! Very good idea turning the broken pot into a love flower arrangement. Your teapot is lovely! I am glad you re purposed it vs throwing it away! A gorgeous Sadler teapot you have! The vignette looks so lovely! Thank you for sharing at TTF! Have a fun weekend. I love it Joy. The teapot is wonderful! Love the colors and the roses. Using it as a vase was a clever idea. I would definately glue the spot back on someday. I just bought a frog just like that one yesterday. Thanks for sharing your creativity with SYC. What a cute little teapot and great idea to use it anyway in in different manner! Great repurpose! Sometimes we just have to spout off. Eh? Thank you for joining Simple & Sweet Fridays.